NVAL is sponsoring a treasure hunt to find a piece of local handmade art. Members and non-members are invited to make the decorative clay globes that will be donated to NVAL and hidden in the Redding and Anderson areas for Easter. These workshops will give artists the opportunity to enjoy creating with clay while participating in a community activity which encourages family fun and generates interest in NVAL — hopefully becoming an annual event! Kim Makin at Makin Glass, 2908 Douglas Street in Anderson is donating the two clay-making workshops to produce 100 art globes. The Workshops will be held at her studio. You can sign up with Kim by phone at 530-365-6316 or at her location in Anderson. Signup also at NVAL Carter House Gallery, 48 Quartz Hill Rd., Redding. Some of the globes will have additional prizes to be won by the finder. Prizes will be donated by local businesses and/or purchased by NVAL. If you have ideas about donations from businesses please contact Deborah Curtis Vercammen on Facebook or on her email: russelld1254@yahoo.com. 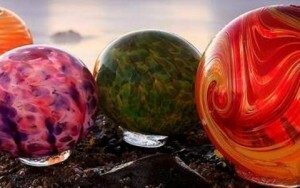 NOTE: The photo above is of glass globes hidden in Oregon and are NOT the ones we are planning to make. Ours will be CLAY. Background that prompted the idea: Lincoln City on the Oregon Coast has been hiding glass globes (3000) for many years and people come from all over to search for them.